This is the week before the Evolution meetings, so the big question of the day is what can I post that I believe to be true, and will rile enough people up to get a good discussion going. I decided Sam Scheiner was a good target – we were graduate students together, he is a good guy, and a great scientist at NSF. BUT, one day on an online discussion, I don’t remember where, he took umbrage at my statement that there is no such thing as genic selection. So, that is today’s thesis: There is no selection on genes. I will actually soften that a little, and bring up a special case that is indeed genic selection. First, an important philosophical point. As I have probably said more times than necessary, quantitative geneticists divide evolution by natural selection into selection and the response to selection. Selection is an ecological process that has no reference to whether or not a trait is heritable. As an extreme example, consider a situation in which one person is painting random numbers on the backs of turtles, and a second investigator, seeing the numbers decides to select for those turtles with the largest numbers on their backs. This is selection, even though it obviously has no genetic basis. More realistic traits can have a heritability anywhere from 0 to 1, so there can be no logical cutoff where we say it is no longer selection. This is of more than philosophical importance. It is of practical importance. The ecological process of selection really is only studied in nature. That is, we, as evolutionary biologists, are mainly interested in the selective forces acting in natural natural populations in natural settings. Further, the appropriate way of studying selection in nature is to use the regression approaches of Lande, Arnold and Wade (Lande & Arnold. 1983. Evolution 37: 1210-1226; Arnold & Wade. 1984. Evolution 38: 709-718). In contrast, the response to selection is a function of genetics. From a practical perspective heritabilities are measured using breeding designs and statistically comparing relatives. In these designs, the mating structure is forced, and comparisons are most easily done in the laboratory (e.g., Falconer and Mac Kay 1996, introduction to quantitative genetics). Finally, there will be numerous situations where we will be interested the measurement of selection acting on interesting organisms or in interesting situations, but we have no knowledge of the underlying heritability of the traits. The distinction between selection and the response to selection tells us that such studies are interesting even without simultaneously doing genetic studies. Thus, for both philosophical practical reasons it is reasonable to separate selection from the response to selection. So, what is the point of this? Genic selectionists are arguing that we can act AS IF selection were acting on genes. As I have argued in the past doing this is fraught with dangers. But more importantly, we have to ask the question do we want to play “as if” games if we are scientists. It would be great for the molecular biologist to be able to assign fitnesses to individual alleles, but they are interested in the genes, not in how selection is working. Such reductionism is very suspect, and, if it does work, probably working for the wrong reasons, so even if your idea of understanding evolution is ignoring the actual process, and just focusing on the change of gene frequencies you are likely to be disappointed. If on the other hand, we are interested in how selection is acting, then “as if” doesn’t cut it. We want to know where selection is acting and such reductionism tells us nothing about the ecology of how selection actually works. For this we need to study selection, not its consequences. When we talk about selection it is best to always identify an “among” and a “within”. The “among” is what level of organization selection is acting on, and “within” is what the range, or scope, of selection is. Thus we can have selection among groups within a metapopulation, selection among organisms within a population, selection among cells within an organism. The point is, to say that even if selection at different levels causes the same change in gene frequency (as I keep saying, they don’t) is to say they have the same consequence, not to say that they are the same thing. So what about genic selection? Well, first off we need an among and a within. The among is pretty obvious, it is alleles. But what is the among within? Except in special cases I will get to, the among within cannot be the organism. Loci and thus alleles are always grouped into genomes and genomes are properties of cells (ignoring viruses here). Further, mitosis stops within genome selection. If you are heterozygous today, you will be heterozygous tomorrow. This is easily handled by contextual analysis. Simply put, because of mitosis, there is no variation in fitness among genes within the genome. Even if we assign fitness at the level of the allele, there can be no variation in fitness among the alleles within the genome, and indeed the lowest level at which it is possible for there to be variation in fitness is at the level of the cell. Thus the lowest level at which it is even theoretically possible for selection to act is at the level of the cell. A Genic selection. Which is the best Gene? All are good, but the correct answer is Gene Kelly. He is well known as a jumping Gene. Top row (left to right) Gene Wilder, Gene Hackman, Gene Simmons. 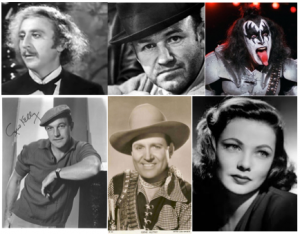 Bottom row (left to right) Gene Kelly, Gene Autry, Gene Tierney. Of course there is an exception to this, and that is transposable elements. Now you can have selection among transposons within the genome. That is because each insertion site can be thought of as a bit of habitat for the transposon to insert into, and for most transposons a transposition event is a form of reproduction. Thus, selection among transposons within the genome is a special case example of genic selection. Lest you want to revel in having finally justified the term genic selection be aware that having high transposition rates is usually not good for the organismal phenotype, so there is selection at the level of the organism against jumping genes. Not only is this an example of genic selection, it is also an example of multilevel selection in which the gene is the individual, and the organism is the group. And, McClintock help us, genes that “choose” not to jump are being altruists (uggh. Hate that term). This entry was posted on Wednesday, June 17th, 2015 at 11:45 am and is filed under Uncategorized. You can follow any responses to this entry through the RSS 2.0 feed. You can leave a response, or trackback from your own site. Oops. Thanks. It is fixed now. This should be ‘the within’.